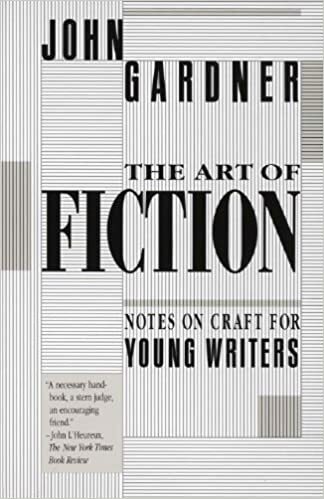 The book: The Art of Fiction: Notes on Craft for Young Writers by John Gardner is not prescriptive in the same way as is Jon Franklin’s book: Writing for Story. Gardner surveys contemporary literature in general, pointing out its structure, methods, and morality. Morality in literature, for Gardner, is whether a story portrays what is real and eternally true about human life, as opposed to what is false or philosophically trendy. This quote is from The Art of Fiction. Though he won the 1976 National Book Critic’s Circle Award for October Light, he deeply offended the literary powers-that-be at the time, especially with his book: On Moral Fiction. In any piece of fiction, the writer’s first job is to convince the reader that the events he recounts really happened…This kind of documentation, moment by moment authenticating detail, is the mainstay not only of realistic fiction but of all fiction…It’s physical detail that pulls us into the story, makes us believe…The importance of physical detail is that it creates for us a kind of dream, a rich and vivid play in the mind. The value of great fiction, is not just that it entertains us or distracts us from our troubles, not just that it broadens our knowledge of people and places, but also that it helps us to know what we believe, reinforces those qualities that are noblest in us, leads us to feel uneasy about our faults and limitations. In great fiction, we not only respond to imaginary things—sights, sounds, smells—as though they were real, we respond to fictional problems as though they were real: We sympathize, think, and judge…All fiction treats, directly or indirectly, the same thing: our love for people and the world, our aspirations and fears. The writer works out plot in one of three ways: by borrowing some traditional plot or an action from real life (the method of the Greek tragedians, Shakespeare, Dostoevsky, and many other writers, ancient and modern); by working his way back from his story’s climax; or by groping his way forward from an initial situation. It’s by the whole process of first planning the fiction and then writing it—elaborating characters and details of setting, finding the style that seems appropriate to the feeling, discovering unanticipated requirements of the plot—that the writer finds out and communicates the story’s significance, intuited at the start. The most obvious forms of clumsiness, really failures in the basic skills, include such mistakes as inappropriate or excessive use of the passive voice, inappropriate use of introductory phrases containing infinite verbs [e.g., Slapping him silly, she proceeded to…] , shifts in diction level or the regular use of distracting diction, lack of sentence variety, lack of sentence focus, faulty rhythm, accidental rhyme, needless explanation, and careless shifts in psychic distance [i.e., the reader’s nearness to the character]. The true writer has a great advantage over most other people: He knows the great tradition of literature, which has always been the cutting edge of morality, religion, and politics, to say nothing of social reform. To write with taste, in the highest sense, is to write with the assumption that one out of a hundred people who read one’s work may be dying, or have some loved one dying; to write so that no one commits suicide, no one despairs; to write, as Shakespeare wrote, so that people understand, sympathize, see the universality of pain, and feel strengthened, if not directly encouraged to live on. John Gardner describes, in far more detail, these things, the state of fiction writing up to the early nineteen eighties, and his thoughts on it all in his book. A worthy read, especially after studying a process for creating works of fiction. The Art of Fiction is highly motivational and recommended.